A Bromsgrove resident has published his first book after it found favour with his own children. 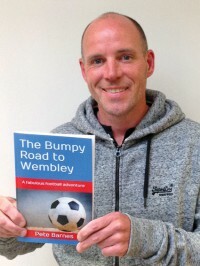 Pete Barnes initially wrote The Bumpy Road to Wembley four years ago to encourage his two children to read. Based on a bedtime story that he used to tell them, the book follows football-crazy kids Jimmy and Danny who, following a comical mix-up with the England coaching staff, are thrust into professional and international football. “I was delighted with the feedback from friends and family so I decided to self-publish. At just over 100 pages long, it’s perfect for reluctant readers and parents who want to read to, or with, their children,” says Pete. The book is available on Amazon for £2.99 (e-book), £5.99 (paperback) or free with a Kindle Unlimited account.